Welcome back to the Troublesome Pairs after a long break full of posts on business and Word. People have been asking about them, so I’ve started writing up a few more. Let me know if you’re pleased that I’ve done this, or if you’ve been helped by a particular Pair, won’t you! This one came up in the cafe one Sunday afternoon, as my friend Gill and I were sipping our coffees, looking things up on the Internet via our phones, talking about all sorts … and putting off venturing out into the rain. 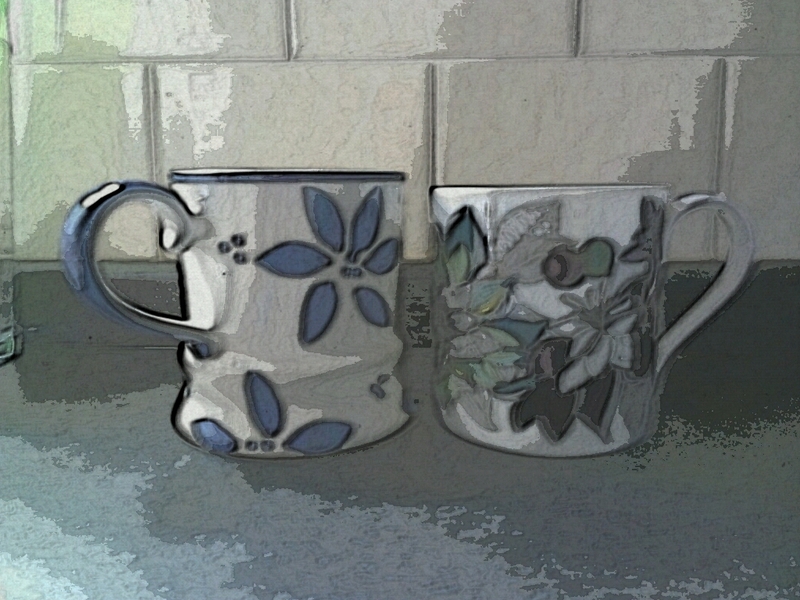 Is there a difference between these two? Do you know what it is? Really? Because we thought that we did and … well … I’m glad that I always look it up to check! To procrastinate means to put off doing something. For example, we were procrastinating when we sat in the cafe chatting about this and that rather than going out into the pouring rain. To prevaricate means to speak or act in an evasive way. For example, when asked whether it was going to carry on raining, a weather forecaster might waffle on about climate change and average daily rainfall in order to avoid telling the truth for as long as possible. I am very happy to say that yes I am, I now have a lovely purpose-built workshop in Pembrokeshire. I have been able to attend one wedding fair and I am hoping to do lots more in the future. The new products that I talked about are still on my ‘to do’ list! I have just passed my driving test, which will make attending fairs so much easier. The biggest change is the fact that we are expecting a new addition to the family in May, so I am having to plan my business around that now. I have learned to manage my workload a little better, so I am not having to work so many late nights/am shifts. Networking is so important, You need to keep at it to stay in the public eye. I recommend getting on to Google + and Twitter, as Facebook is making it harder and harder to be seen. Set up a website: many website providers are free and super easy to use, and around 70% of my commissions come via the website! Join a group of like-minded business people for support,advice and ideas. It is also lovely to feel a part of a community: working from home can be lonely so the friendly chatter and banter is very refreshing! You might like to read my blog post on running your own online business, it is a free guide aimed at offering a little advice from one small business to another. I hope to be running cake decorating classes locally and to be on my way to having a tutorial book published. However, this might take more than a year, as I think the new baby will slow things down. I am also working on a new range of clay characters that will make extra special keepsake gifts for special occasions. You can find the Twinkleballs website at www.twinkleballs.co.uk and Jenny is also on Facebook and Twitter. Of course, you can email her too! Hopefully, you’ve already read about simple Find and Replace in Word in my earlier post. 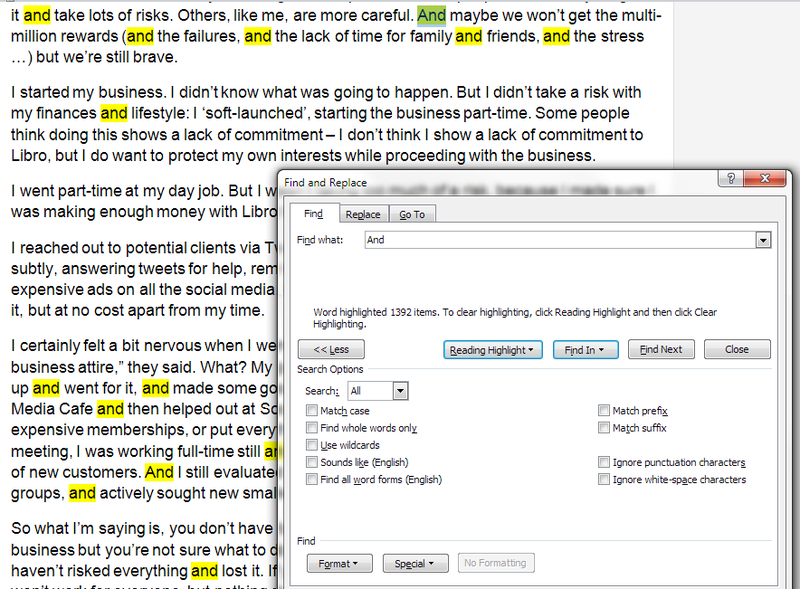 In this article, I’m going to show you some of the Advanced Find features to do with word forms, wildcards and where you’re actually searching. 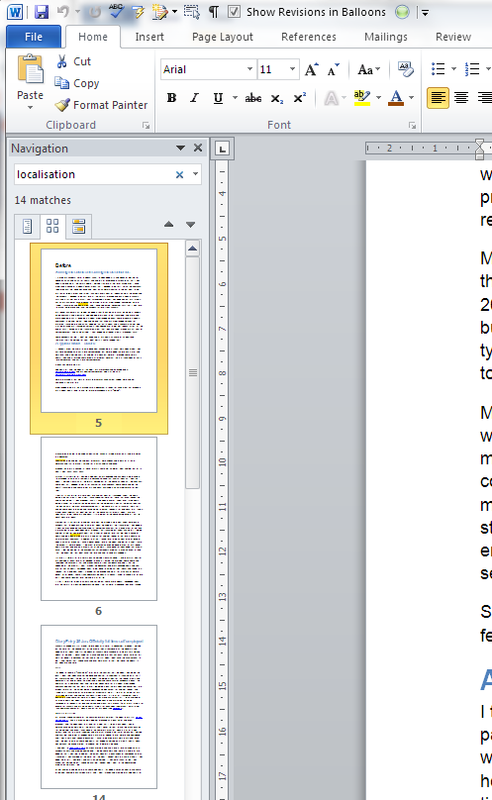 Handily enough, these are the same in Word 2007, 2010 and 2013. For hints on replacing, see the previous article, and for finding formats, look out for my next post in this series (I will link it to this post once it’s live). I’m going to start by discussing the three different options for viewing the results of a simple Find search in Word 2010 and 2013, then move on to the Advanced Find options in all three versions. 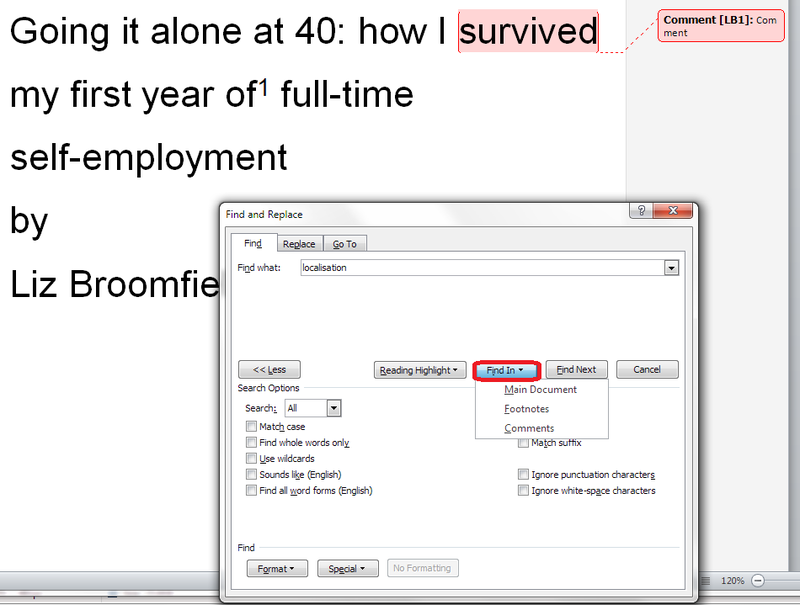 When you hit Ctrl-F to Find in Word 2010 and 2013, you are shown the Navigation side panel. This gives you three options for viewing the results of your simple search (i.e. you’ve searched for just a word or phrase, no whole word only or match case options applied). 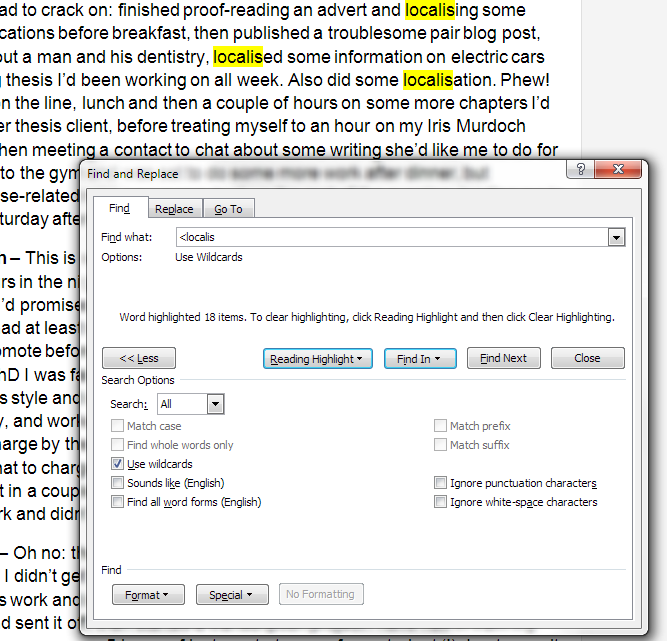 The first tab on the left gives you the Outline view – if you have headings in your document, it will give you a run-down of those,and highlight in yellow where your search term appears. 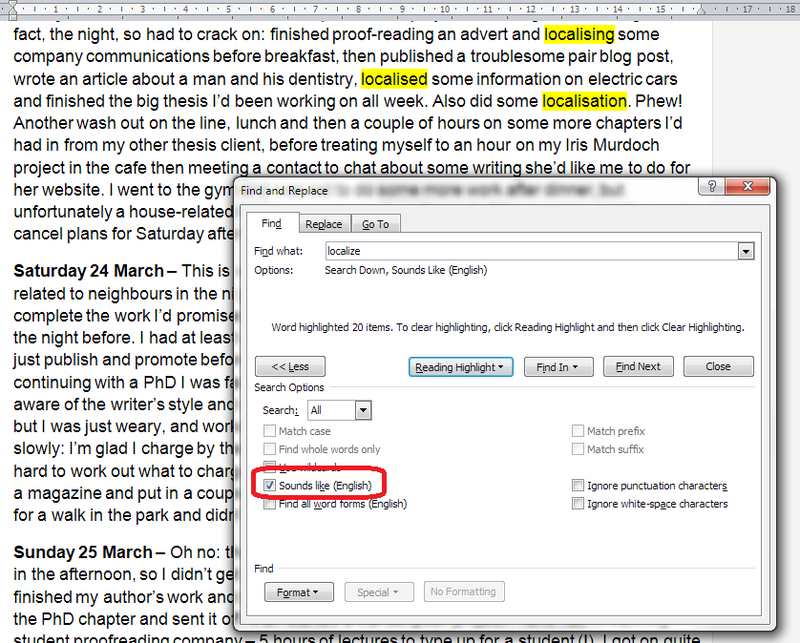 The search term “localisation” has been input into the search box at the top. The second tab gives you a Page view, showing only the pages that the search term appears on (you will see that it’s displaying pages 5, 6 and 14 here) with the search term highlighted. The third tab along gives you the Paragraph view, and this is the one that I find most useful, as it shows you the search term in its context. Click on the box and you’ll navigate to that place in the text. As you can see here, the word has also been highlighted in the actual text, and this is true for all of these views. 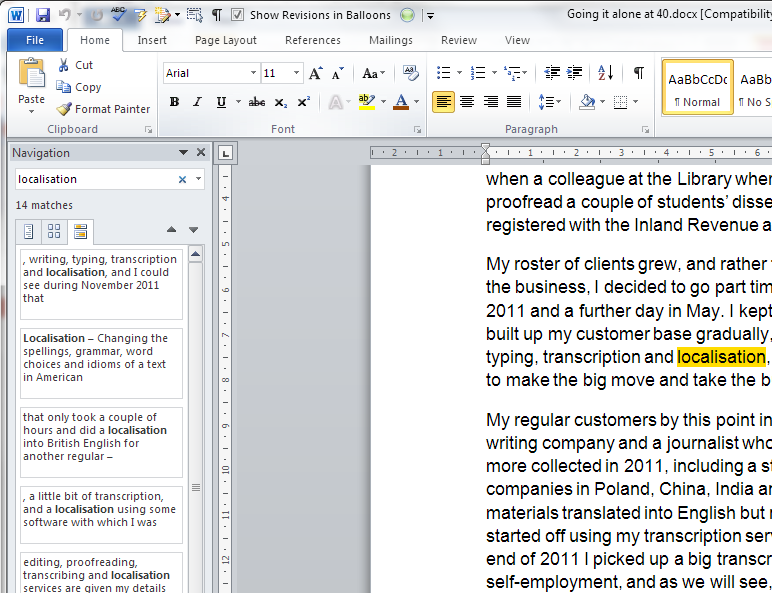 This paragraph view is the most useful for seeing where you’ve used a word and deciding whether to change it. Now we’re going to look at some of the Advanced Find options. 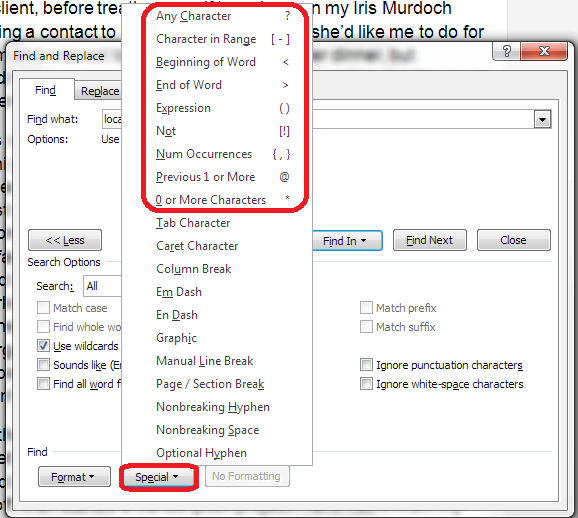 You can get to Advanced Find by clicking on the More button in Word 2007’s Search box, or by clicking the down arrow by the search input field and choosing Advanced Find in Word 2010 or 2013. 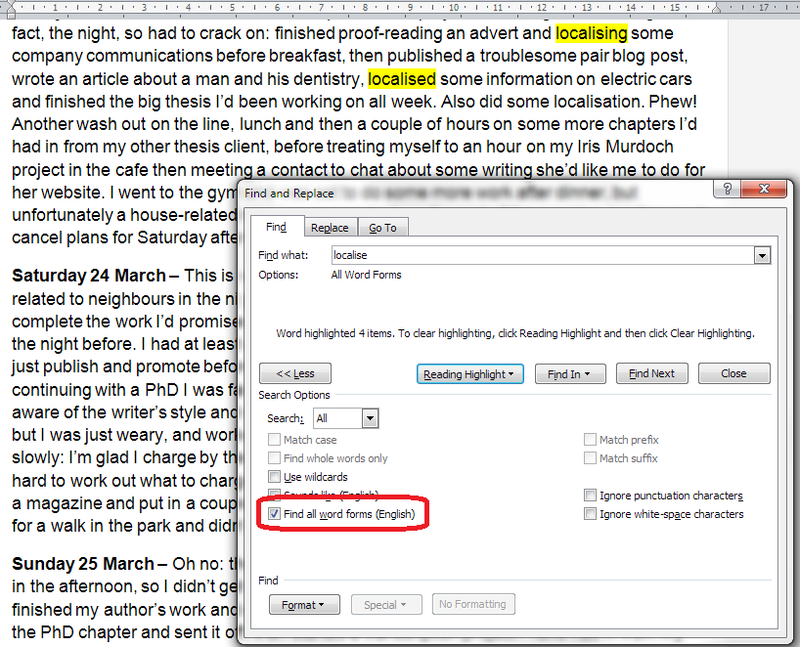 Note, in Word 2010 and 2013, you can click on Options after clicking the down arrow, but that isn’t as specialised or useful as choosing Advanced Find. If you’re confused about how to find the Advanced Find dialogue boxes, read this post for screen shots and explanations. Whichever of these options you choose, it will only search in that area, saving time and narrowing down your search to exactly what you’re looking for. Match case is extremely useful if you are only looking for a particular form of a word. For example, I might want to catch the instances where I’ve started a sentence with “And”. 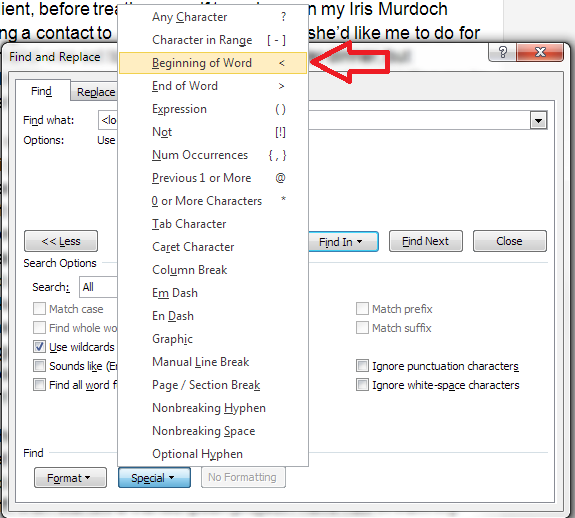 If I just search for “and” with no other options set, Word will usefully highlight all instances of the word. I’ve highlighted the one that I’m looking for in green here, but you can see how hard it would be to find amidst a sea of and … and … and. Note that I typed the word in with a capital letter, but unless I tell Word to take account of that, it will ignore it, and treat And, and, aNd, ANd, Andy, understanding, etc. all the same (to get rid of those last two, see the next section). 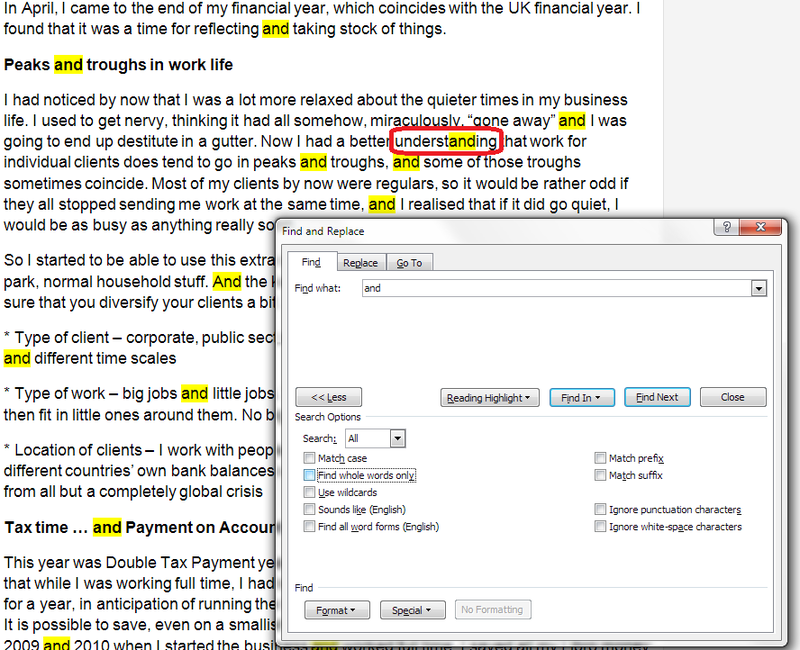 As we saw briefly above, search for “and” without ticking any additional options, and Word will find the letters “and” however they may be capitalised and wherever they will be. Here, a search for and highlights the word understanding, too. Lots of people know about the above two options, but Wildcards can seem a little alarming to the novice or even quite experienced Word user. Wildcards allow you to search very precisely for different forms or spellings of a word. 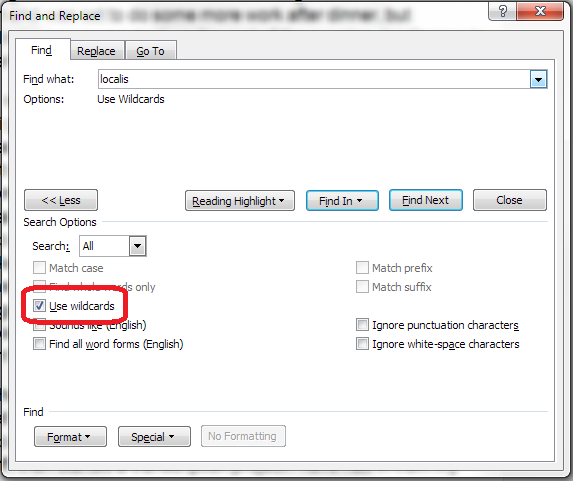 To use Wildcards in your search, tick the Wildcard option. Now, you could just do a basic search for a bit of a word, but that’s only useful if the selection of letters you’re looking for all occur together. In the example above, we’re looking at the letters appearing at the beginning of a word, but what if you’re looking for a word and you can’t remember how you spelled it, or you fear you sometimes used an s and sometimes a z in “organisation”? Use the question mark option and search for “organi?ation” and you will find both spellings. Note, there are many further special characters here apart from the ones used for Wildcards (which are ? – < and >) – I will be covering some of the most useful of those in future posts. The two options at the bottom of the list can look quite tempting. But I will be honest and say that I don’t use them in my everyday work (if you do, please comment and share why you find them useful!). Sounds like is the more useful of the two. It only works for the English language (presumably if you’ve bought a UK or US copy of Word) and it does what it says it does, finding words that sound like the word that you have entered. Here I’ve searched for “Localize” and it has found the words that I would be looking for. They’re not spelled the same, but they do sound the same. 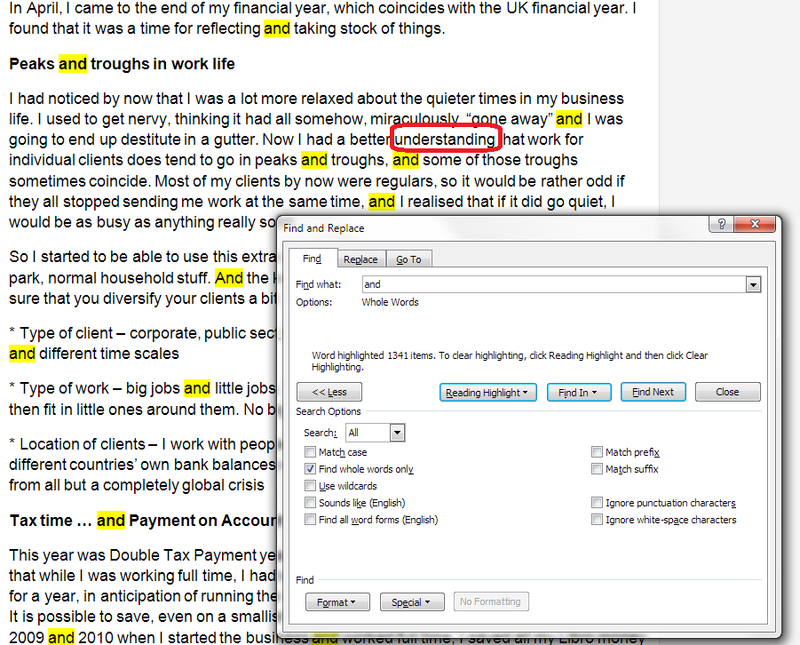 In this article, we’ve learned how to use some of the more advanced features of the Find function in Word 2007, Word 2010 and Word 2013 in order to be able to look for the correct, specialised word in our document, including being able to choose where in the document it is and choosing fewer or more examples of words containing the letters we’re searching for. If you’ve found this useful, please take a moment to share it, using the buttons under the article, or send me a comment, as I love hearing from my readers and knowing that I’ve helped! Thank you! Following on from my posts about how important it is to have a website for your business and on setting up your WordPress blog (which you need to read before reading this if you’re a novice), in this article, I’m going to show you how to add pages to your WordPress blog to make it into a website. This is what I did when I created this website that you’re reading this blog post on right now. I’m going to use my special test WordPress blog to show you what to do, and also the inside workings of this blog for the more complex aspects. Read on to find out how to set up web pages on your blog, and first of all, why you would do that. What’s a WordPress page and why do I need them? A page is a static, unchanging screenful of information, for example what you see when you go to my About page on this blog, or my page about my Business e-book on my writing blog. Where a blog post is written, published, moves down the blog page and is superseded by new blog posts, like a diary, a web page is fixed, stays the same and is visible whenever you visit its home. Where a blog is like a diary, a web page is like a passport photo or a lawn sign. Why do you need one? Well, when someone reads your blog, they’re going to be bound to want to know something about you – that’s why pretty well all blogs have an About or Home page. And if you run a company, it’s advisable to put together a page, or a set of pages organised into some kind of structure, that tell readers about what you do, how you do it, what it costs, etc. Website readers have a low attention span. They want to read a bit of stuff then move on. Many of them don’t even like scrolling down to see what’s lower down on the page. So a) they’re not going to want to search or scroll through your blog to look for information, and b) they don’t want everything on one web page. My website is quite wordy; imagine what it would be like if all that information you can access along the top menu bar was all on one page. So, you’re convinced that you need at least an About page. You understand the difference between pages and posts (pages = static; posts = constantly updated diary type affair). 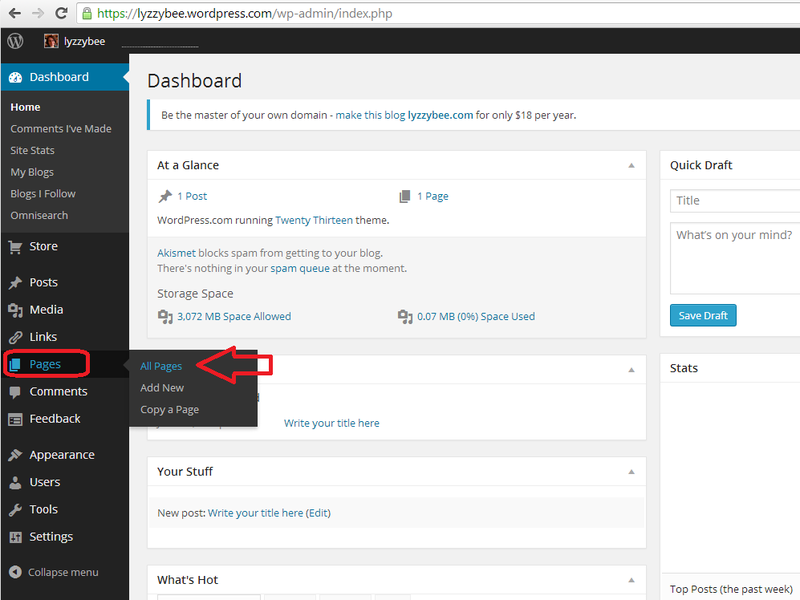 Let’s find out how to set up a page on WordPress. How do I set up a Page on WordPress? You access Pages from the Dashboard (click on your blog name or the little house icon next to your blog name on your Stats page to reach it). Once in the Dashboard, go down to Pages, click, and choose All Pages. 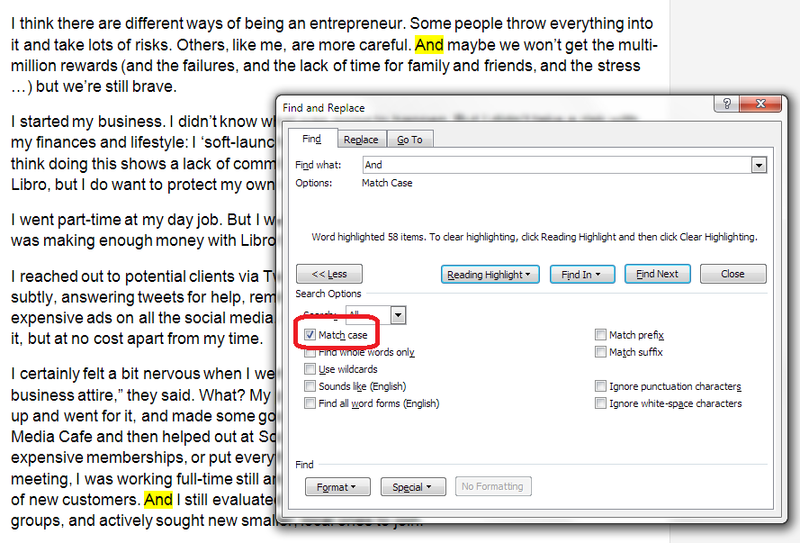 This allows you to see what pages are already there – and once you have some, you can edit them from here. Why have I gone here first rather than hitting the New Page option? 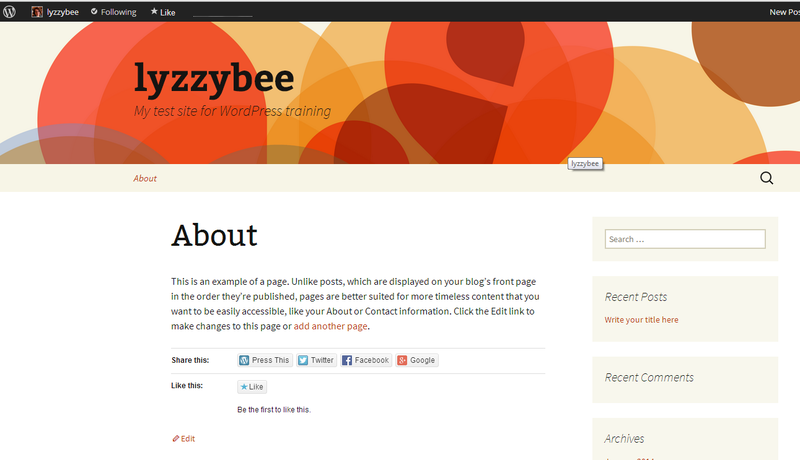 Because every new WordPress blog has an About page set up already, to get you started. 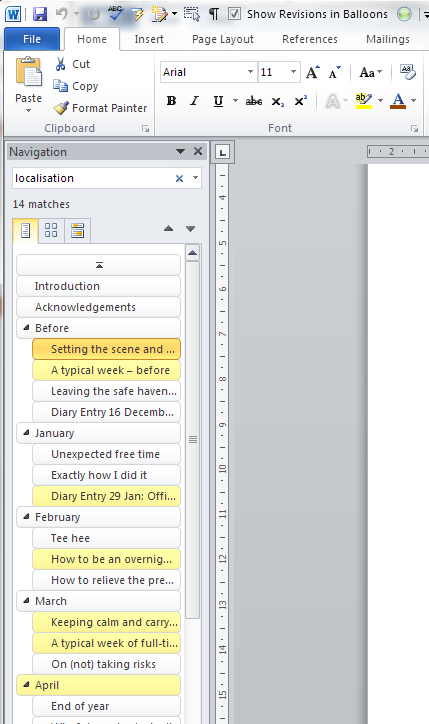 When you click Edit, you’ll arrive at a screen which looks very like the one that you use to create a new blog post. 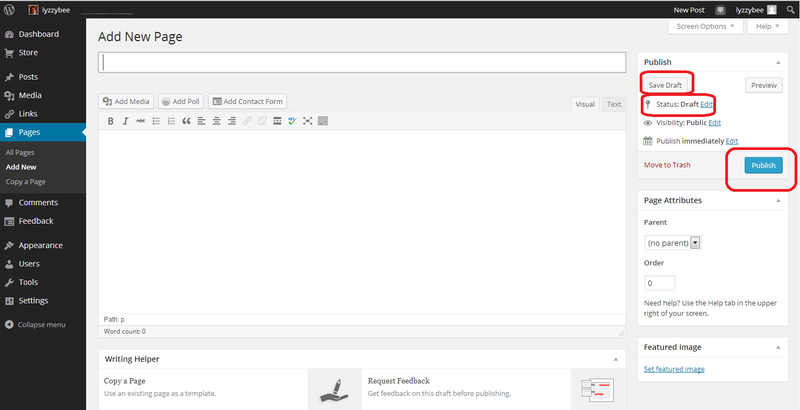 However, it has Edit Page at the top, and some Page Attributes to the side. You can see that you have a title area (which includes the word “About” and a text area, which also contains some text at the moment.This can all be edited and customised just how you want it. This is likely to open in a new window – if it doesn’t, hit the back button on your browser to get back, or the Edit button at the bottom (or top, depending on your theme). How do I set a web page to be my landing page / front page? In some circumstances, you might want a static page to be the home page / landing page / front page that a visitor to your URL will always see. 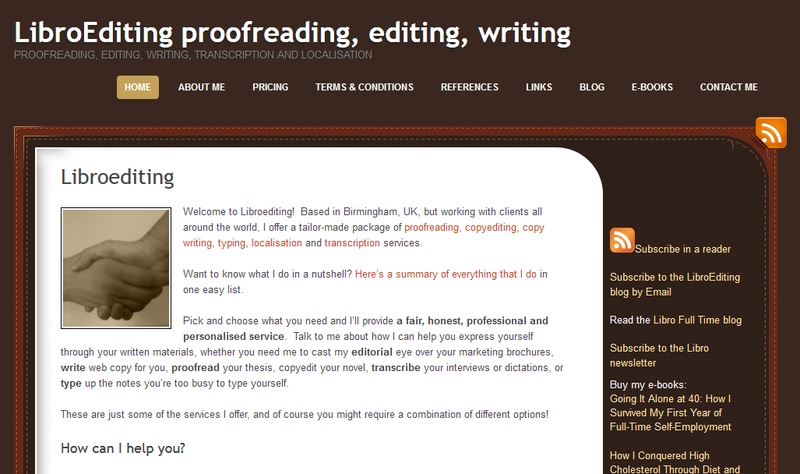 I do that with this website – whenever you go to www.libroediting.com, you will see my Home page. However, visit www.librofulltime.wordpress.com and you’ll see the latest blog post I’ve published, and you’ll need to click on the top menu to see a static page about you. It’s all about what you choose to do. I’d recommend that if you are primarily blogging, with just one or two pages about you and your background, leave the landing page as the blog. If you’re promoting a company, product or service, and your blog is supporting that and driving visitors who you want to buy from you, choose to display a static web page when a visitor arrives. 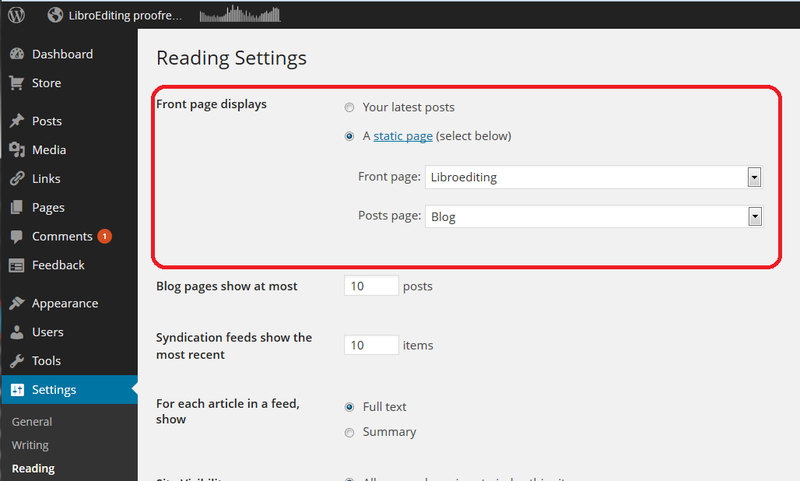 Here’s how you tell WordPress to show visitors a page, not your latest blog post. Go to the Dashboard, choose Settings, and then Reading. Right at the top of the page, you have a section entitled Front page displays. You have the choice of Your latest posts (i.e. your blog) or A static page. If you click on that radio button, you will be asked to choose a page to display. I have chosen not to do that for this test website/blog, mainly so that I can change it if I’m training people face-to-face, but here’s how this Libroediting site is set up. 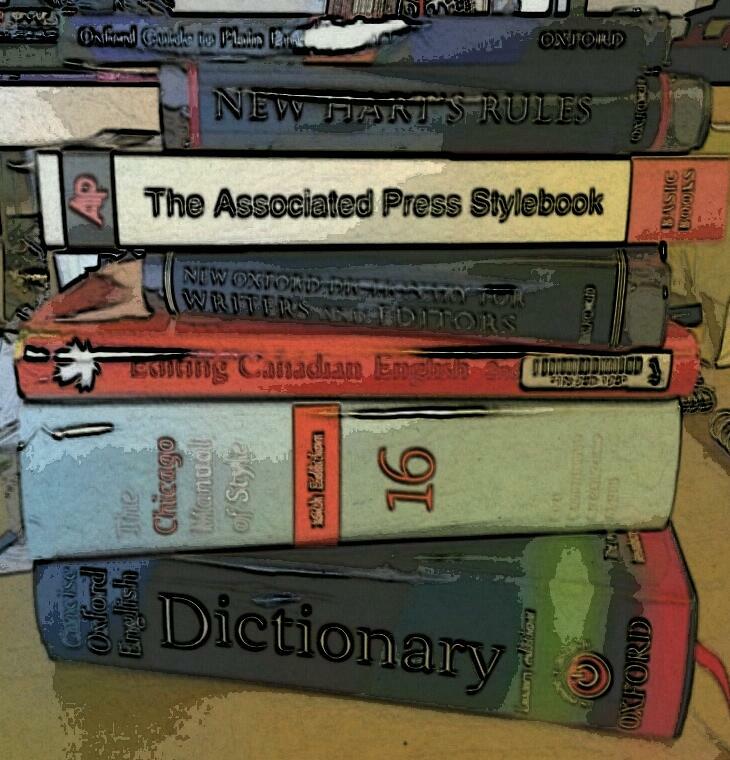 I have chosen Libroediting as the front page, and Blog as the posts page. That means that any visitor will, as you’ve seen if you clicked the link above, see my Home page on their initial landing on the site. How do I add a new Page to my WordPress website/blog? … and you will find yourself in a completely blank editing page. Note that now the Status reads Draft, and you also have an option to Save Draft. Please press this very, very regularly, so you don’t lose your draft posts. When you’ve finished adding the text for your new page, hit the Publish button to make it live (or you can leave it in Draft form if you want to work on it further; just do remember to Save Draft). How do I view and edit my pages? 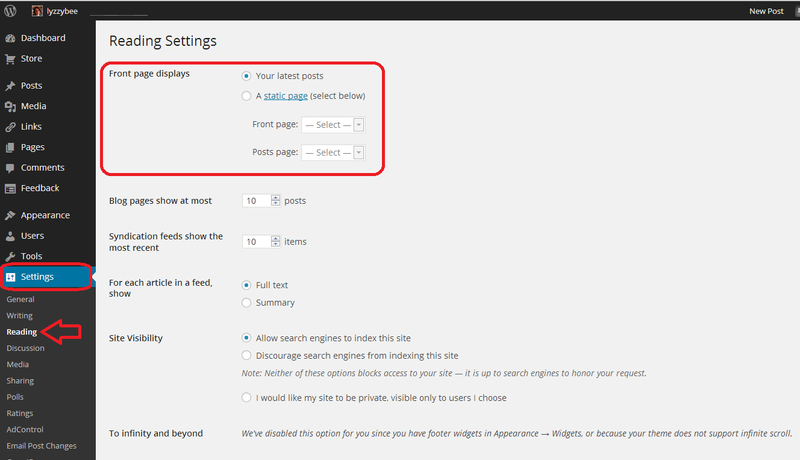 You can view all of your pages by going to the Dashboard and choosing Pages – All Pages. Here is part of my page list for this website. If you hover over any page title with the cursor, you’ll get the Edit / Quick Edit / Trash / View options to allow you to make any changes you want to. If you have any pages in Draft form, not yet published, you’ll see Draft next to All / Published / Trash and you can click to see all of your draft as opposed to published pages. How do I change the order in which my pages appear? How do I create sub-pages? It’s good to be able to control what order that top menu and any side menus appear in. As you get more pages published, you might find there are too many for the menu to display, and it starts to look a bit messy. You might want to arrange pages in sub-categories, under other main pages. Looking at the page itself, you can see that the page name is number six in the list of pages along the top! 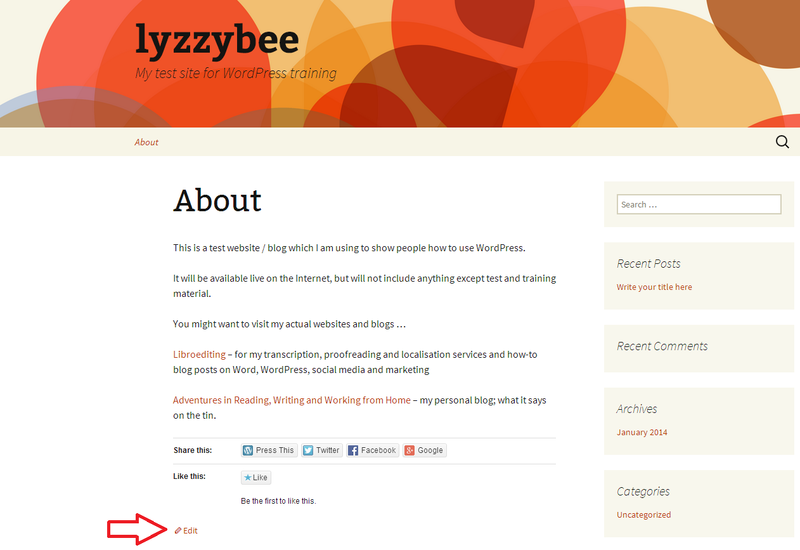 Note: not all designs of WordPress blog have the menus automatically along the top. But they should appear at the top or down the side. Play with the choice of design if it’s not where you want it to be, or add a menu to the side bar, which we will learn about another day. How do I do a quick edit? 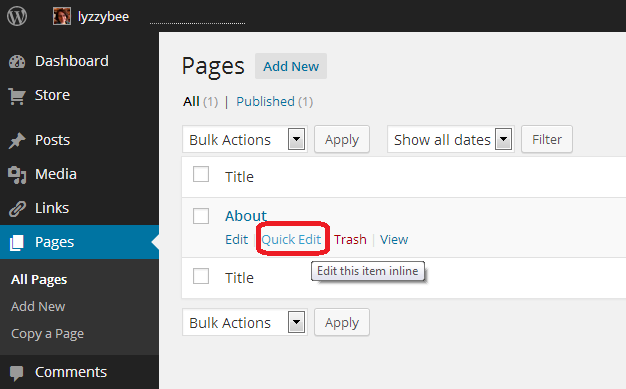 If you just want to change the title, page order or other attributes for a particular page, view All Pages, hover over the page title and choose Quick Edit. You will get a limited number of options, but this can be a quick way to do an update. Click Update to save. 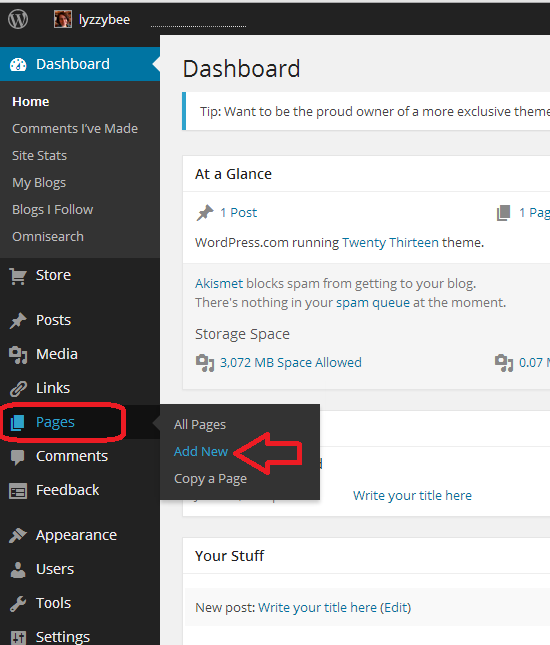 In this article, we’ve learned how to add web pages to a WordPress blog to make it into a website, using WordPress.com hosted by WordPress itself. These basic ideas should be the same on self-hosted WordPress sites. I hope you have found this article useful. Please share using the share buttons below, or post a comment, and do please let me know if you use this article to help you to set up your own blog, and post a link below! In my networking adventures and other travels in the world of small business, I come across quite a few people who don’t have a website. To be honest, I’m a bit shocked when this happens. Unless you’ve got a constant set of clients, with new ones on the horizon to fill in any gaps if you lose one, then you’ll want to be findable. When you think about getting the roof done, or finding a cleaner, or sourcing flowers for an event, or buying a product, where do you look? Even if you look for a tradesperson on a Yellow Pages style website, I bet you like to have a URL to click through to, to look at their details. Right? If you don’t have a website, even a single page with your name / company name and information about yourself, then what will people find when they search for you? How do people search for companies, products or services? It’s a good idea to have your company name in the url for your website, but personally I don’t hold it against small companies if they have the word blogspot or wordpress in their URL – you don’t need to pay extra to have that if you don’t want to. You can use a Facebook page as your company web page, however I would hesitate to ONLY use something that changes so often and is as unpredictable as Facebook. A company Facebook page is better than nothing, however! You can add these extras if you want and if they add value. If you find that you’re getting a steady stream of enquiries via your simple website, and they turn into paying customers, then only add these items if you can see a clear value in doing so, rather than doing it out of vanity or because someone’s persuaded you to buy their service. A professionally designed website – there are so many “themes” on offer that look as good as professional websites. It’s really important to have a web presence so that people can find you. It’s really important to be super-vigilant, because unscrupulous companies prey on small businesses’ lack of expertise in this area. If someone offers to build your website make sure – no, MAKE SURE – that you will be able to edit and update the text and pictures on that website whenever you want to. Never hand over the full ownership of your site to another person such that you can’t update it yourself. 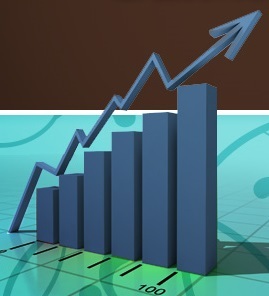 If you haven’t got a website, and you haven’t got a steady stream of new and regular customers giving you a good income stream, I really do suggest that you get a website! Read more here about growing your business, have a look at my advice on blogging and social media, read about how to set up a WordPress blog and website (starting with this post) and read about my own business journey in my book, Going It Alone At 40.